Florida’s Bartow Police Department announced this week that they were able to stop two students enrolled at Bartow Middle School from carrying out a stabbing spree on their fellow classmates. School administrators were alerted to the plot on Monday after a student informed a teacher that they’d overheard one of the perpetrators mentioning that “something bad” would be happening at the school’s building 500, Bartow Police Chief Joe Hall said at a press conference on Wednesday. That teacher later informed Bartow’s Principal Christopher Roberts of the complaint. On Tuesday, law enforcement officials, in addition to the school resource officer, were called to the school grounds as a precaution. After school officials received a call from a concerned mother about her child being absent from class, authorities launched a search party for said student. The mother was the parent of one of the girls who allegedly plotted an attack. Both students were found hiding in a bathroom near building 500 by Bartow Assistant Principal Chandra Johnson. Police say the two girls, aged 11 and 12, were found holding a goblet. Upon a more thorough search, several weapons, including a paring knife, butcher knife, pizza cutter and a knife sharpener were reportedly found in their possession. The girls were charged with conspiracy to commit murder, possession of a weapon on school property and disrupting a school campus. It’s unclear if the they will be charged formally as adults or juveniles. 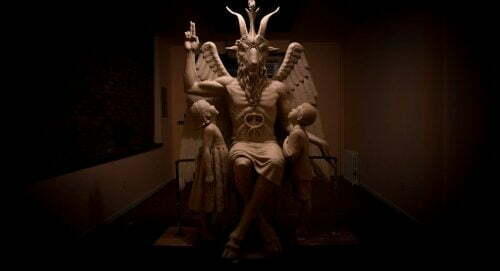 Lucien Greaves, cofounder and spokesperson for The Satanic Temple, told Sputnik that if the entertainment industry provided more accurate representations of Satanism, such incidents would not take place. “Perhaps ironically, if there were less dramatically false representations of Satanism in popular culture, and more accurate representations expressing what we truly believe and what we practice, I believe we’d see incidents like this, rare as they are, disappear completely as it became generally recognized, by consumers of news and perpetrators of crime alike, that Satanism provides no justification whatsoever for heinous crimes,” he added. For the meantime, Bartow Middle School will have an increased police presence as a precaution, Florida’s ABC Action News reported. Polk County Schools Superintendent Jacqueline Byrd has also stated that she will be filing for the girls’ expulsion. No, the devil made them do it. attention, or did the girls not know it is forbidden to kill people , 15? Pretty soon God and Jesus have made them do it. Take your own responsibility. A TOTAL CRAZY WRETCHED,. AND DANGEROUS WORLD. Don’t you people realise how sick and insane you all have become?